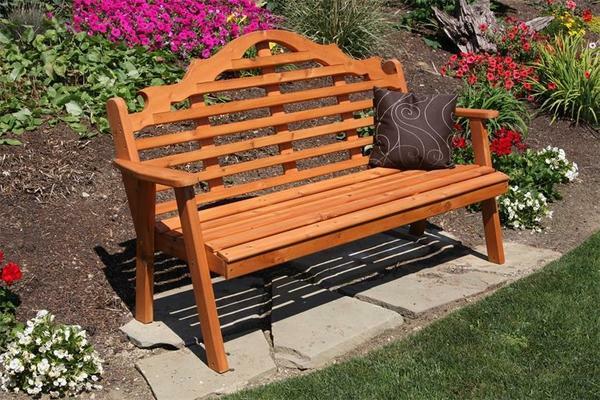 The Amish Made Western Red Cedar Marlboro Bench creates a romantic scene in your garden or backyard. Place this wood bench in the spot you find most relaxing with an outdoor view you can enjoy. Made of solid cedar wood, this outdoor furniture will become a favorite spot to retreat to outside. Under the oak tree or next to the rose bushes, the Amish Cedar Wood Marlboro Garden Bench will beckon for you to sit and enjoy the day. Sit with your morning coffee, afternoon iced tea or evening wine and let the Marlboro bench surround you in comfort. Keep the Red Cedar Marlboro in mind for someone special. This cedar outdoor furniture makes the perfect gift. Choose your custom made size. We offer a 4', 5', or 6' length. Consider a lovely Marlboro cedar bench for your business entrance. DutchCafters works closely with business owners to provide the custom furniture they need. Visit our Contract Sales Page for more information.